The Eastern Region Championship saw some terrible weather in Red House West Virginia with wind and snow, but in the end we did get enough to crown the Eastern Region Champion and for 2014 that title goes to Deweese's Duce owned by William Deweese. Shown with Justin, Chris & K.J. Floyd- and winning $239 for their efforts! 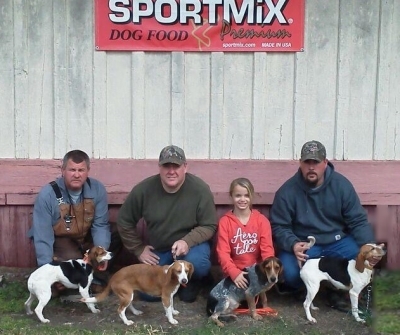 63 Dogs entered the Michael Floyd Memorial Hunt held at the Barrineau Beagle Club in Lake City, SC. When the dust had cleared it was Michael's two sons and Grandson standing Victorious in their Dad's Honor!! Congrats guys. I know your Dad is smiling down on you!! Thanks for all the judges and everyone who came out to brave the cold weather. Daisy and Brandon Haskins win 2013 PKC TN State Championship! 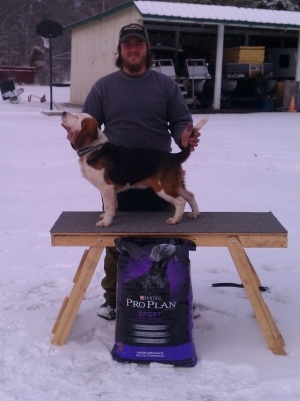 The 2013 TN PKC Hound and Hunter State Championship was held Saturday with Daisy taking the top honors. Below are pictured the Final Four. Congratulations to ALL of the winners! 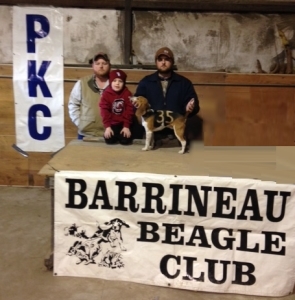 Read more: Daisy and Brandon Haskins win 2013 PKC TN State Championship!